I was watching the movie "Eternal sunshine of the spotless mind" when I heard the phrase "That was like three seconds" from Kate Winslet. You can find this phrase at 01:14:25. She and Jim Carrey were kidding and playing. She held a pillow tightly over his face, then he pretended to be dead (suffocated) in order to frighten her. Oh, my God. That was terrible. That was like three seconds. What did she mean? I searched the web, but none of the meanings that I found for "second" or "three seconds" makes sense in this context. It just means that the duration was approximately three seconds long. She is either referring to how long she held down the pillow or to how long he was pretending to be dead, but I can't find the clip online to confirm. 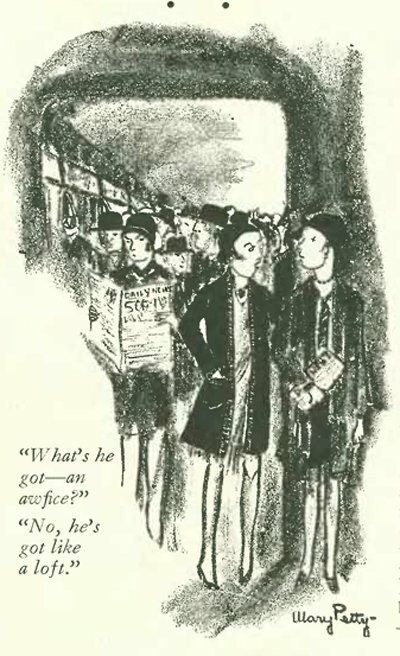 Here is a cartoon from The New Yorker magazine, 1928. The use of “like” for “about” or as a discourse marker goes way back. It was also common usage by Beatniks. Somehow, it's been around a long time. It is used by young people a lot even today. Its origin is not really working class. It is used in informal speech. It would be frowned on in any formal setting. "Like" here is functioning as a particle rather than an adverb - she is not comparing anything to "three seconds", but saying that she was only holding him down for three seconds, which shouldn't have been enough time to smother him. I believe that, in the scene, Kate's phrase was a Hyperbole wherein her saying, "That was, like, three seconds," isn't a literal statement to Jim's 'quick death' but rather her exaggerated, and sarcastic, response to how quickly he 'died'. For example, a similar use of this kind of phrase is often used by the speaker as a sarcastic, or ironic, reply to something that subverted his/her expectations (much like how a straightman responds to the punchline to a joke). Picture two individuals: Tom and Tim. Tom asks Tim to go out and get him a coffee, expecting Tim will be gone for 10+ minutes. Tim leaves only to come back less than 5 minutes later with Tom's coffee. Tom, surprised, exclaims, "Dude! That was, like, three seconds!" Alternatively: Tom asks Tim to make a pot of coffee in the next room. Tim leaves to the room to make coffee while Tom waits. However, Tom remembers (less than a minute later) he left his phone in that room as well and enters to ask Tim to pass it to him. However, upon entering the room, Tom sees that Tim had completely destroyed the room with spilled coffee grounds, creating a mess that seems impossible to make given the short amount of time passed. Tom blurts out, "Dude, it's been, like, three seconds." That was like x seconds (or any other amount of time) can mean it took approximately this amount of time. And yes, of course this is all relative, 3 seconds is very short for 'not breathing' but it can also be a used to hint that something takes a long time. Not the answer you're looking for? Browse other questions tagged meaning-in-context spoken-english or ask your own question. What does “that would be that” mean? What does “three-stone weakling” mean? this go-round — what does that mean? What does “a virtual three-way tie” mean here? What does “have been through two or three jobs” mean? What does “just like that” mean?